Having trouble storing cable rolls in your van? Modul-System is now launching a new cable shelf, specifically designed for this purpose. 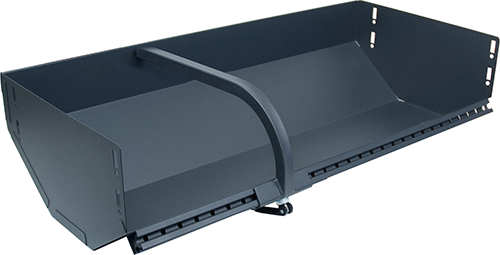 The shelf is supplied with a fixing arm that holds the rolls in place while driving. The fixing arm is mounted onto the shelf’s T-track, and can easily be pushed to, and locked in, the desired location. The arm will also be supplied individually in case you require more than one arm for your shelf. The cable shelf is 810 mm long, and will fit on a 324 mm deep racking kit. Extremely secure and robust, our new Modul-Safe is the perfect solution for storing valuable items in a vehicle. The Modul-Safe can be integrated into the racking system, or it can be used as a stand-alone product. Thanks to the double-wall construction, the Modul-Safe is extremely difficult to break into. The double, individual locks increase security even further. The Modul-Safe is 486 mm wide, 324 mm deep and 486 mm high. Please follow this link to view a film which shows someone attempting to break into the safe for over 7 minutes without succeeding. The inner walls of the safe have a tool board pattern and by adding Modul-System’s tool holders you can create an efficient storage space for keys and other similar valuable items. If you have any further questions regarding the Modul-Safe, please do not hesitate to contact our sales team.